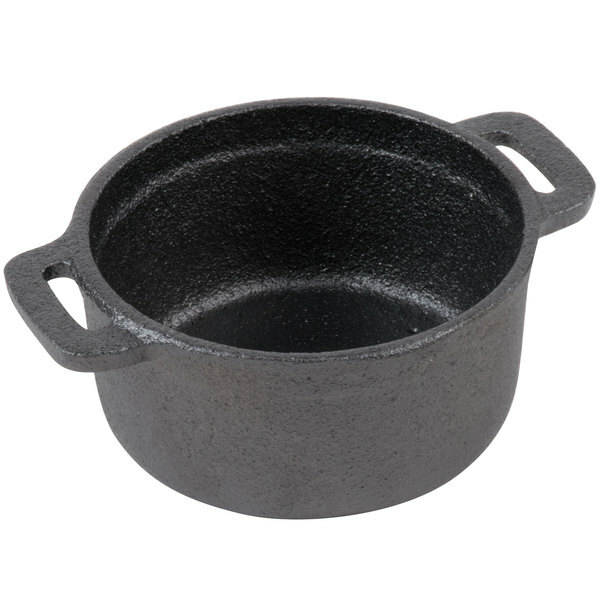 Valor 4" Pre-Seasoned Cast Iron Round Mini Pot - 8 oz. 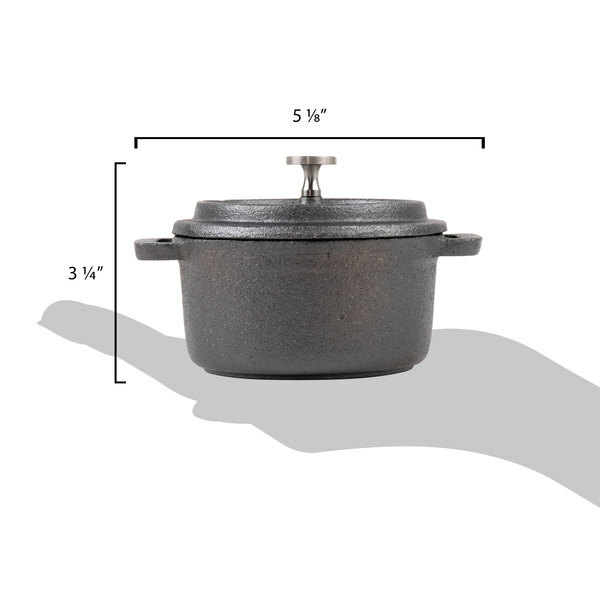 Valor 5" Pre-Seasoned Cast Iron Round Mini Pot - 16 oz. Today we're going to show you how to season cooking pans. Pan seasoning is essential to any food service operation, as it keeps your pans from rusting and your food from sticking to the pans. Seasoning cooking pans saves you time and money. We'll show you how to season five different types of cooking pans in this video. A cast iron skillet, a carbon steel fry pan, a carbon steel wok, a tin-plated pan, and a hard coat aluminum pan. 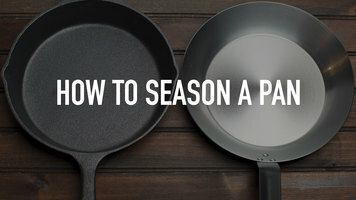 Pan seasoning is essential for keeping your pans performing their best in your kitchen. This instructional video will show you the proper steps to seasoning your cooking pans based on their material. For a carbon steel pan, start by washing, rinsing, and drying the pan. Heat the pan on your range on medium to high heat, then add shortening to the pan. Use a clean dry towel to spread the shortening around the interior of the pan, creating an even coat. Remove the pan from the heat, wipe out the excess shortening and let it cool. You can repeat this process up to 3 more times. 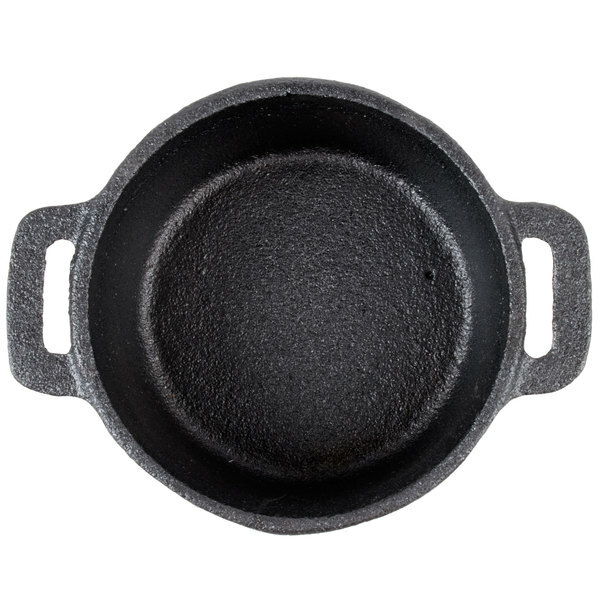 For a cast iron skillet, preheat your oven to 400 degrees Fahrenheit. Line a baking pan with aluminum foil and set aside. Wash, rinse, and dry your skillet. Place the skillet in the oven for 15 minutes. Remove and coat the entire skillet with shortening, inside and out. Place the skillet in the oven for 45 minutes with the baking pan on a rack below it to catch any mess. You can repeat this process up to three more times. Seasoning your pans enables you to cook great-tasting food with minimal oil, butter, or fat. 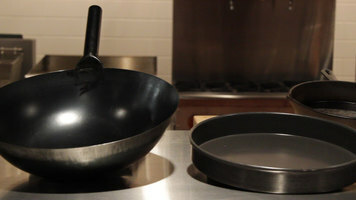 It also provides a stick-resistant surface, allowing for easy clean up, and will keep your pans from rusting quickly. Check out this video to learn how to season cast iron and carbon steel pans. American metal craft invites you to set the table for creativity. when it comes to dramatic food presentations, American metal craft table top and buffet supplies set the table with refreshing creativity. Take this tasting station for example. A Shaffer less buffet is possible using American metal crafts stainless steel griddle and many cast iron pots and pans. The etch fuel guard provides functional flair. 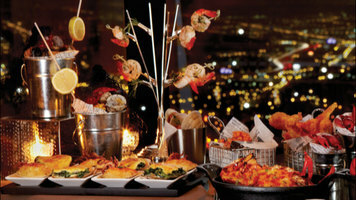 The seafood tower and trays add interesting height while saving valuable table space. Double wall hammered bowls keep cold foods properly chilled in elegant style. Mix in some porcelain sauce cups with porcelain and hammered stainless steel trays and you've got one attractive display all from one single food service supplier. Let's move on to an evening seafood buffet. This scene really maximizes the use of American metal crafts line of the individual serving pieces. Galvanized pales with individual seafood servings are wrapped in American metal craft food safe paper. Toasted appetizers rest in American metal crafts square porcelain sauce tops presented in a black serving board. The interesting spikes with the garlic shrimp, that's American metal crafts sterling silver tasting tree, a unique item that can also hold and serve dessert lollipops. To the right of the tasting tree are stainless steel serving cups and many stainless steel fry baskets lined with newspaper print food safe paper and filled with delectable fried calamari and shrimp. 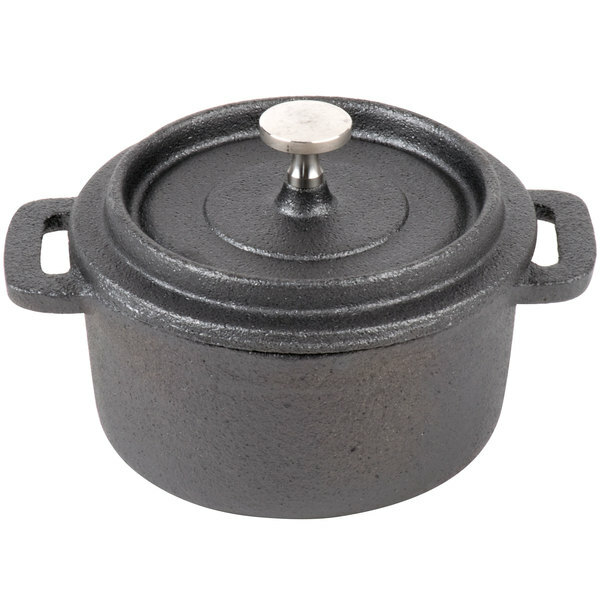 Mix in America metal crafts mini cast iron pots and casseroles that are great for heated individual servings that go straight from oven to table. And last but not least, place ribbed sauce cups or any one of the other sixty plus sauce cups that American metal craft has around the table for a little grab and go. Wherever you go, whatever table you set don't forget to include some American metal craft brush satin stainless steel holders. Our company has more than forty different card holders,signs and clips to identify with style. And speaking of identifying with style we hope you've identified more than a few of American metal crafts unique food service supplies that you'd like to incorporate into your next event. We set the table you get really creative. American Metalcraft's products are a great way to bring quality and style to your buffet tables. American Metalcraft has everything you need--from sauce cups to stainless steel tasting trees--to make your food display visually dynamic. How can I properly care for cast iron surfaces? In order to prevent unwanted build-up of oils, grease, and food, surfaces should be cleaned after use while still slightly warm. Harsh chemicals or scouring pads should not be used—only hot water and a cloth or sponge are needed. If some areas require extra cleaning, a mild scouring pad can be used. Please refer to our Pan Seasoning Guide for further information on properly cleaning and seasoning cast iron surfaces. Give your meal service the ultimate presentation with this American Metalcraft CIPR42 4" round cast iron individual serving casserole dish! From pasta, casserole, and pot pie to baked macaroni and cheese and vegetables, this mini cast iron dish lets you bake a variety of foods to a satisfying tenderness. This piece in particular features a miniature size, making it perfect for serving individual portions in your restaurant, diner, bar, or cafe. Great for kitchen to table service, cook and serve your featured menu items all in the same dish. Two handles provide easy carrying and transport; and, its included lid seals in moisture, flavors, and aromas, maximizing the flavor of your culinary creation! 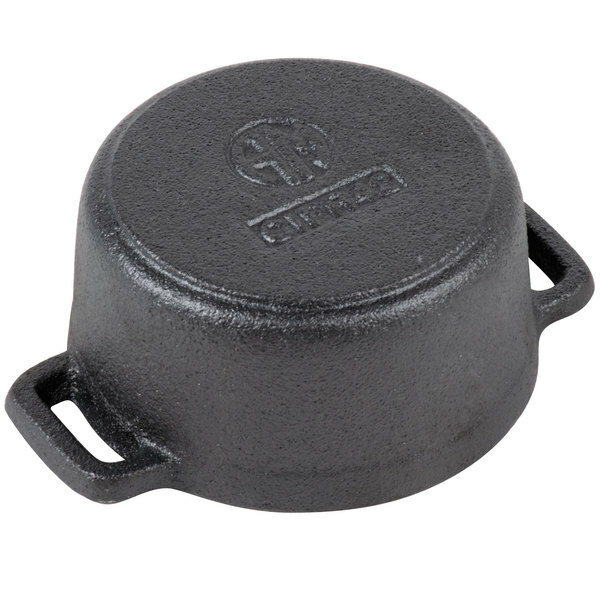 Made of cast iron, this dish is extremely durable and reliable, ensuring you a high-quality product that provides excellent heat conduction and retention. As cooking with cast iron becomes more popular, this American Metalcraft dish is sure to bring your establishment a, time-honored tradition. Give your entrees an enhanced taste and your food presentations a rustic appeal! This item can withstand high heat applications and is safe for oven use in food service. To preserve quality, this item should only be hand-washed and sanitized. We use these every day for our top selling dessert. We bake a flourless chocolate cake and top it with a housemade marshmallow for our S'more. Just wipe clean so they don't rust. 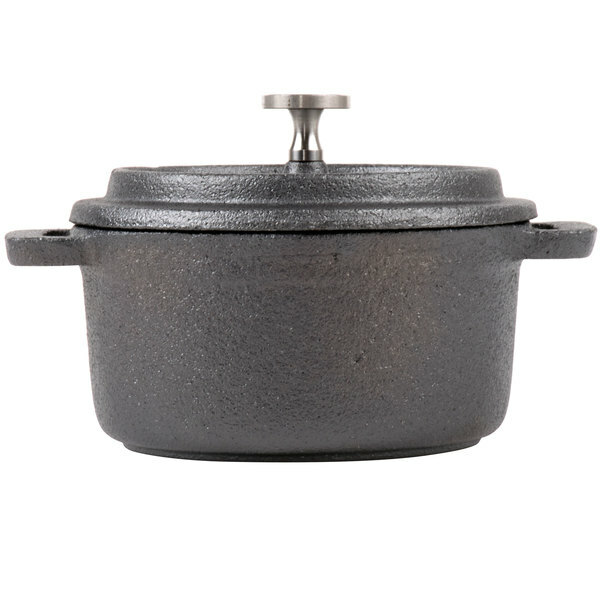 I absolutely love these mini cast iron pots! They work well for braising small pearl onions!! They are equally great for keeping small portions of food hot while you cook other items!!! 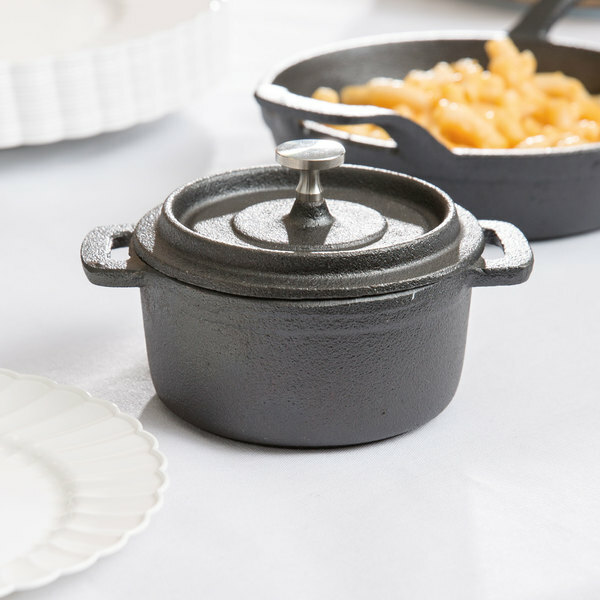 The 4" Round Cast Iron Individual Serving Casserole Dish is great for appetizer dips, such as spinach and artichoke, or for entrees like macaroni and cheese or even chili.